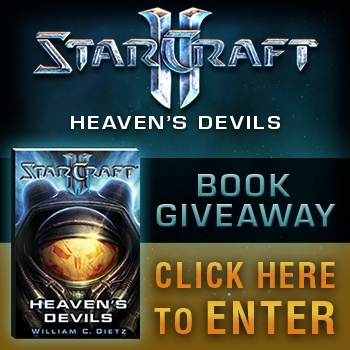 Thanks to Sneak Attack Media, we had five copies of StarCraft II: Heaven's Devils to give away to our awesome community. After the dust settled from the zerg rush of submissions, we were able to choose five winners at random. For the first time ever, StarCraft enthusiasts will learn the origins of the enduring friendship between the young upstart Jim Raynor and the streetwise soldier Tychus Findlay. Watch as they battle on the front lines of a fierce interplanetary war and bear witness to the Confederacy's rank corruption ... corruption so reprehensible that it rains immeasurable death and destruction upon the government's own people. In order to be eligible for this book, participants needed to take our StarCraft II quiz and complete it 100% correctly. From there, we chose five people at random to receive the prizes. Keep checking back right here on The Escapist for more great contests and giveaways!